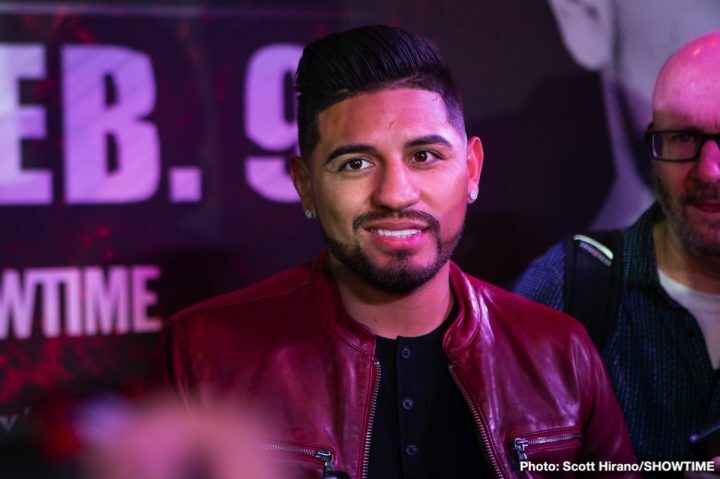 By Jeff Aranow: Former three division world champion Abner Mares says he’s been given clearance from his ophthalmologist to start training again following eye surgery for a detached retina on his left eye. It could have been a career-ending injury for Mares had his eye not been repaired successfully, but fortunately for him the surgery fixed the problem. This wasn’t the first time Mares had problems with his left eye. He had the same problem 11 years ago in suffering a detached retina for his left eye. Mares was able to have the problem taken care of with surgery, and he later captured world titles at 118, 122 and 126. Mares’ success as a pro came after he suffered his first detached retina in his left eye in 2008. It’s going to be a lot harder for Mares to win a world title at super featherweight if he insists on going after a belt in that weight class. The only vulnerable champion at 130 is WBA ‘regular’ super featherweight champion Andrew Cancio. Mares might be able to beat Cancio if he could handle his inside game. Cancio is an excellent puncher on the inside, as we saw recently with his 4th round knockout win over former WBA World super featherweight champion Alberto Machado on February 9 on the Davis-Ruiz undercard. Even Cancio might be too powerful for Mares. Mares, 33, doesn’t say who he plans on fighting next, but it’s not likely WBA Super World super featherweight champion Gervonta ‘Tank’ Davis (21-0, 20 KOs), who he was scheduled to face last month on February 9 on Premier Boxing Champions on Showtime in Carson, California. Mares (31-3-1, 15 KOs) had to pull out of the fight when he learned that he had suffered a detached retina. Hugo Ruiz stepped in and took the fight with Tank Davis instead, and was wiped out in the first round. It’s possible that Mares could still face Davis, 24, if he’s interested in rescheduling. It would obviously be a tough fight for Mares to take with him coming off eye surgery, and a loss to Leo Santa Cruz in his last fight in June of 2018. It’s good that Mares is able to start training again. However, it would be best if Mares moved back down to super bantamweight or bantamweight rather than moving up to super featherweight to go after a fourth division world title. Mares’ latest loss to Santa Cruz showed that he doesn’t have the pop in his punches for him to handle the best fighters at 126. Going up to 130 to take on one of the best champions in that division in Gervonta Davis would be a bad idea on Mares’ part. The money would be good for Mares in taking the fight with Gervonta, but the outcome likely will be a bad one for him. Davis is knocking everyone out now, and he’s looking like he’s going to be very tough to beat by anyone in the super featherweight division, especially by an older fighter with little punching power like Mares. “My eye is really good. As you can see, it’s been a little bit past a month, almost two months since the surgery. It looks good. This is big news for me. I can’t wait. Hopefully, soon I’ll be back in the ring,” Mares said.